To start off your shopping experience in Nice, you've got to see Galeries Lafayette. And lucky for you there are two of them in the city! If you recognize this national chain, you'll know this huge department store has anything you might want and with any budget in mind. Whether it be a top designer piece or just something you forgot to pack for the trip. 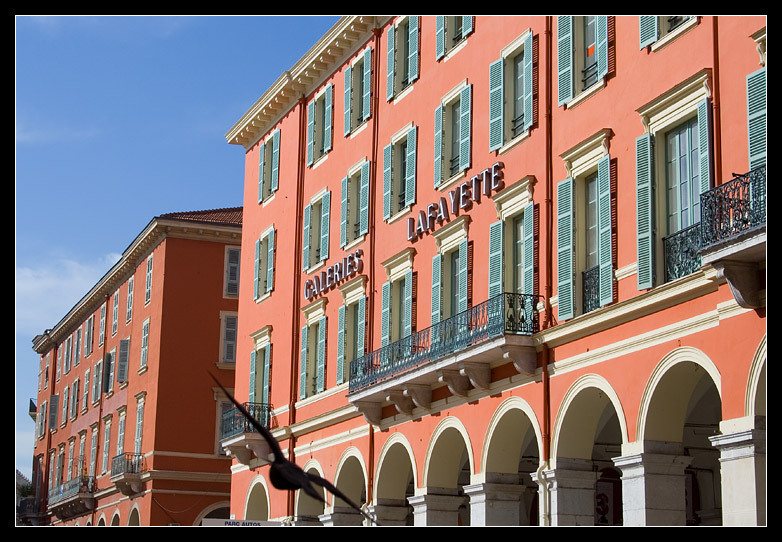 The Nice city center Galeries Lafayette is situated at: 6 avenue Jean Médecin, along the tram route, next to Place Massena near the beach. 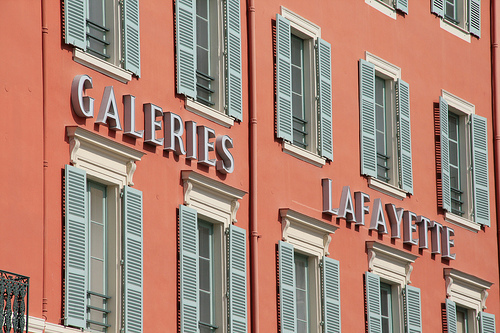 Believe me, you won't miss seeing Galeries Lafayette in it's landmark location next to the city center square. Here is a quick rundown of what you can expect to find; the main floor level has jewelry, purses and a large cosmetic area to name a few items. With other levels above the main floor that have whole areas dedicated to children and women's wear. Of course I love the men's wear level. It always seems like I am buying something there since they have such a good variety of items to choose from. Name a brand, it can be found here, this is a great section to buy something to wear to the clubs or even swimwear for the beach. The selection of male retail clerks working in the men's department is not too bad either. They are very helpful and also informative as to what is happening around town. 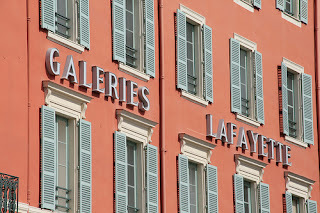 On the upper levels of this Galeries Lafayette you'll be able to find household goods, luggage and fine china. 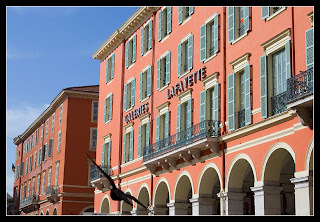 Take a moment and enjoy the restaurant overlooking Place Massena. This location is open everyday from 9am-8pm and they will now be open Sundays starting March 20, 2011 from 10am-8pm. 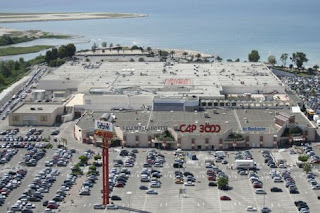 If you wanted to see the other Galeries Lafayette location, you'll have to head out towards the airport where right across the river in the St Laurent du Var neighborhood you will see France's 8th largest mall, Cap 3000. 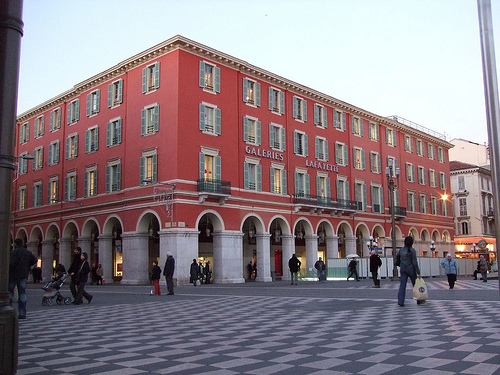 One easy way to get there is to just hop on the train in Nice towards Cannes and two train stations later you will arrive at Saint Laurent du Var station. Step off the train there, cross the bridge over the train tracks and freeway, continue to walk South and you will soon find Cap 3000. It's maybe a 5-7 minute walk away. Personally, I find this Galeries Lafayette to have a stronger selection of goods to choose from as opposed to the city center location in Nice. Here you will find Galeries Lafayette takes up an enormous part of the mall and covers two levels including a large gourmet food area. Many people I know actually go to this location when the store is having a sale as the discounts are better. There is also the only Starbucks in all of the Cote d'Azur inside this mall across from Galeries Lafayette on the main mall level. Don't forget that if you are a non-resident of the European Union you are entitled to claim back the 12% tax that you paid on your purchases within the store, so hang on to your receipts. While you are here, the rest of this mall has some great shopping too, certainly something for everyone. 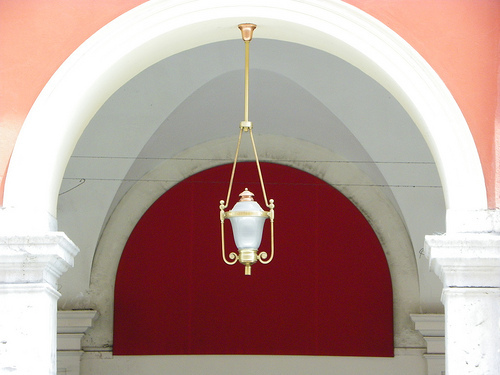 Take a leisurely look around. Fabulous! We love how Galeries Lafayette has a Dior accessories shop, and we look forward to the new Gucci shop-in-store opening soon!